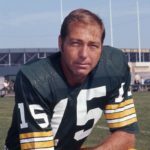 Bart Starr is a former professional American football player and coach. He played quarterback for the Green Bay Packers of the National Football League (NFL) from 1956 through 1971. Starr was the only quarterback in history to lead a team to five league championships (1961–62, 1965–67), before Tom Brady tied the record during the 2016 season. Starr led his team to victories in two Super Bowls: I and II. As the Packers’ head coach, he was less successful, compiling a 52–76–3 (.408) record from 1975 through 1983. "Anyone can support a team that is winning – it takes no courage. But to stand behind a team to defend a team when it is down and really needs you, that takes a lot of courage." "Athletic competition clearly defines the unique power of our attitude."